TG Settings. Finished with Storm and Cyclops. The most popular version as it was the first one available for a long time. An improvement over yesterday morning's Japanese version score !! All perfect until the final Dr. Wily fight. Used an older version of Wolf because of a missing redump. T16 entry (tourney rule: game over @ first lost round). 14/22 perfect. 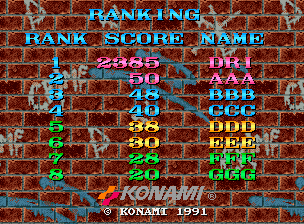 Sloppy mess, but with a lucky Round 2 perfect against Bison for the 80K bonus.